Toronto Raptors guard Danny Green (14) guards Denver Nuggets guard Jamal Murray (27) in the first quarter at the Pepsi Center. 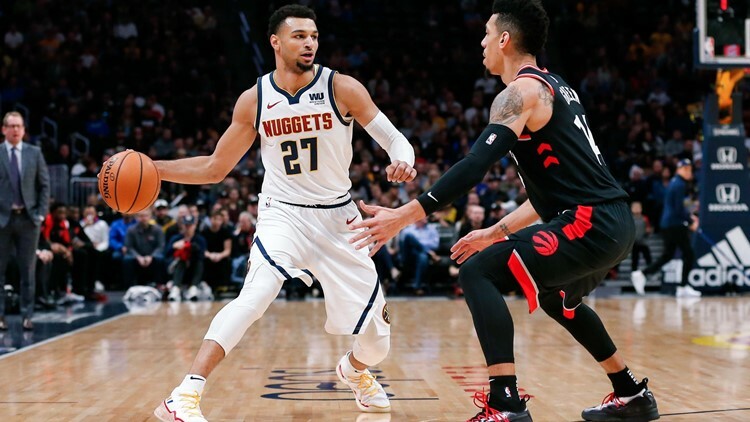 Nikola Jokic scored 26 points, Jamal Murray had 15 of his 19 in the fourth quarter and the banged-up Denver Nuggets rallied past the equally banged-up Toronto Raptors 95-86 on Sunday night in a contest between conference leaders. Toronto pulled to 86-83 with 3:28 left, but Mason Plumlee's layup gave Denver some breathing room. The Raptors were 4 of 23 from the field in the fourth quarter, including 1 of 13 from 3-point land. Not that Nuggets coach Michael Malone gave it much thought. Raptors coach Nick Nurse doesn't expect Lowry or Siakam to miss much time. Lowry sat out his second game with a bruised thigh, while Siakam was sidelined after experiencing back stiffness following a hard fall in Portland.